With three amazing theme parks, Universal Studios FloridaTM, Universal's Islands of AdventureTM, and Universal's Volcano BayTM (Now Open), and dining and non-stop nightlife at Universal CityWalkTM and 6 world-class on-site hotels — all within walking distance of each other — Universal Orlando ResortTM is an entire universe of action and thrills for every member of the family. © 2019 MARVEL. 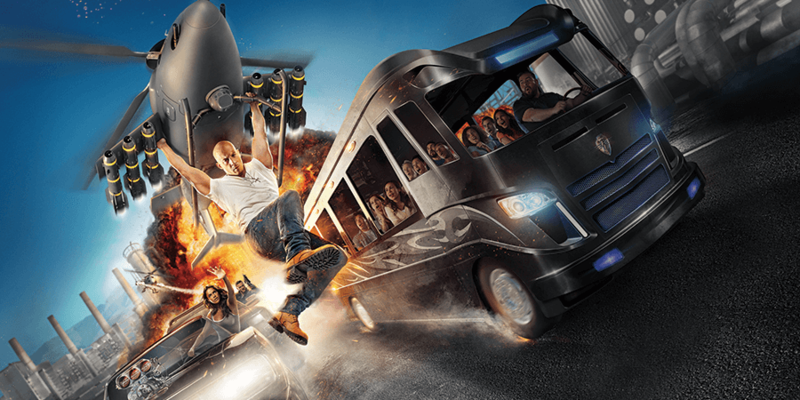 Fear Factor TM & © 2019 Endemol Netherlands B.V. Men In Black & Alien Attack: TM & © 2019 Columbia Pictures Industries, Inc. All rights reserved. Curious George ®, created by Margret and H.A. Rey, is copyrighted and trademarked by Houghton Mifflin Harcourt Publishing Company and used under license. Licensed by Universal Studios Licensing, Inc. All rights reserved. Woody Woodpecker’s Nuthouse Coaster ® Walter Lantz. The Barney name and character, related characters and the overlapping dino spots and Barney and star logos are trademarks of Lyons Partnership, L.P. Reg. U.S. Pat. & Tm. Off. and other countries. THE SIMPSONS RIDE TM Twentieth Century Fox Film Corporation. The Simpsons TM & © 2019 Twentieth Century Fox Film Corporation. All rights reserved. T2, TERMINATOR © Studiocanal S.A. ALL RIGHTS RESERVED. Shrek 4-D © 2019 DreamWorks Animation LLC. All rights reserved. TRANSFORMERS and its logo and all related characters are trademarks of Hasbro and are used with permission. © 2019 Hasbro. All Rights Reserved. © 2019 DreamWorks L.L.C. and Paramount Pictures Corporation. All Rights Reserved. Dr. Seuss properties TM & © 2019 Dr. Seuss Enterprises, L.P. All rights reserved. Rocky and Bullwinkle and Friends TM & © Ward Prods. All Popeye characters TM & © 2019 KFS, Inc. TM Hearst Holdings, Inc. Jurassic Park River Adventure, Camp Jurassic ® Universal Studios/Amblin. © 2019 BMP. Universal elements and all related indicia TM & © 2019 Universal Studios. All rights reserved.